This new 90 page magazine-book hybrid, subtitled “Nowhere Else But Here,” is based on a project I undertook last June, writing every day for the whole month (one of Minnesota’s finest months). For the project, I observed the progress and passing of June using the Japanese form haibun. That’s a fancy word for something that is simply, beautifully, the combination of prose and haiku poetry (you know, three lines of five, seven and five syllables, respectively). In this collection, the prose tells of the journey through the season, and the haiku are images captured on that journey. I think I’ve produced a high-quality publication and I’d love it if you’d buy a copy. I am hoping it would be good for your soul during these dark winter months to read these daily entries about days of sun and swimming in the river, nights of fireflies and driving home with your hand out the window in the cool, damp air. The tales find me traveling from Minneapolis to the St. Croix River, from the northern forests to simple morning walks around the lake. 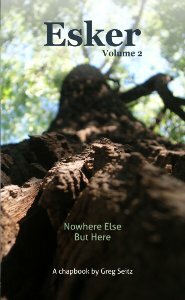 In addition to the the 30 haibun, “Nowhere Else But Here” also features my photos on the front and back cover, both taken in June in the St. Croix River valley. And, as a bonus, there is a prologue to the chapbook that includes some of my favorite previous writings on summer in Minnesota. You can get your own copy for just $12. Ordering online is quick, easy and safe. Thanks! Yes, you can still buy Esker – Volume 1 here! This entry was posted in life on Friday, January 15, 2010 by Greg.